Did you know that Shugar Soapworks makes two brands of soaps? Both use the same natural ingredients and high quality scents. Both deliver the same rich lather and rejuvenating clean. The difference is the name, the scents, and where you find them. Shugar Soapworks scents include our Oatmeal & Verbena, Oatmeal & Coconut, Oatmeal & Lavender, and Lemon. These can be found at Dollar Tree Stores and Dollar General Stores across the country. Venezia scents include Rose, Lemon Verbena, Honey Almond, and Cucumber Melon. They are designed to bring refreshing, natural garden scents to your everyday life. 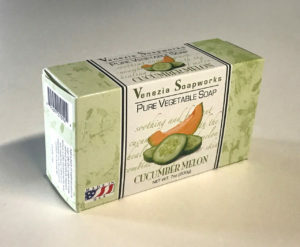 Our Venezia soaps are found at these stores: Grocery Outlets, 99 Cents Only Stores, Roses, Maxway, Super10, SuperDollar, and Bills Dollar.